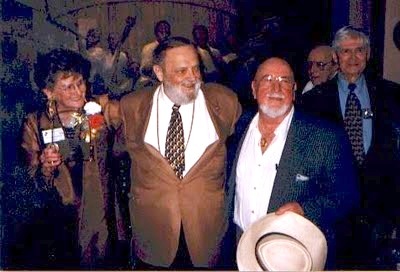 With this post, George and I remember Mrs. Frances Fernandez, long-time President and Board member of the New Orleans Jazz Club, who dedicated her life to the appreciation of New Orleans's jazz musicians. We also remember Bill Hemmerling, a beloved local artist who painted the 2005 poster for the New Orleans Jazz and Heritage Festival. After painting Louis Armstrong in 1995 and Pete Fountain in 1996, George Rodrigue declared that he was finished with Jazz Fest. 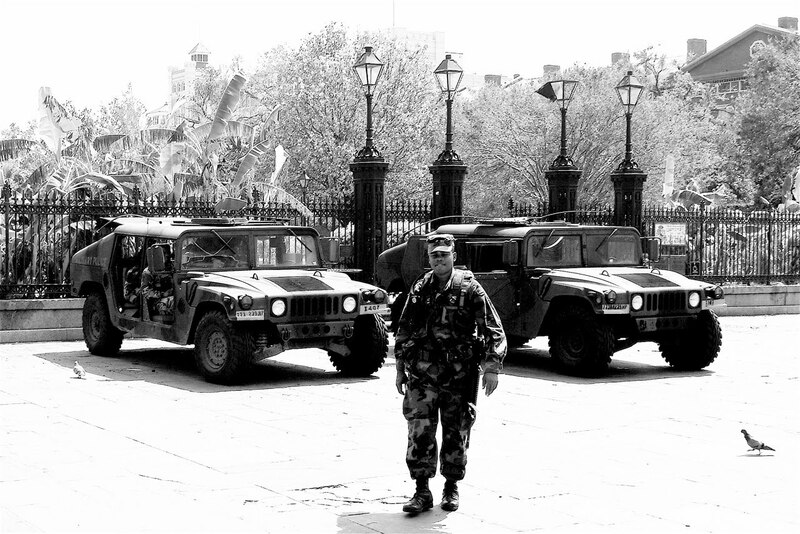 The last minute subject change and picketing artists in 1996 affected him greatly, and he did not want to deal again with the politics and personalities. 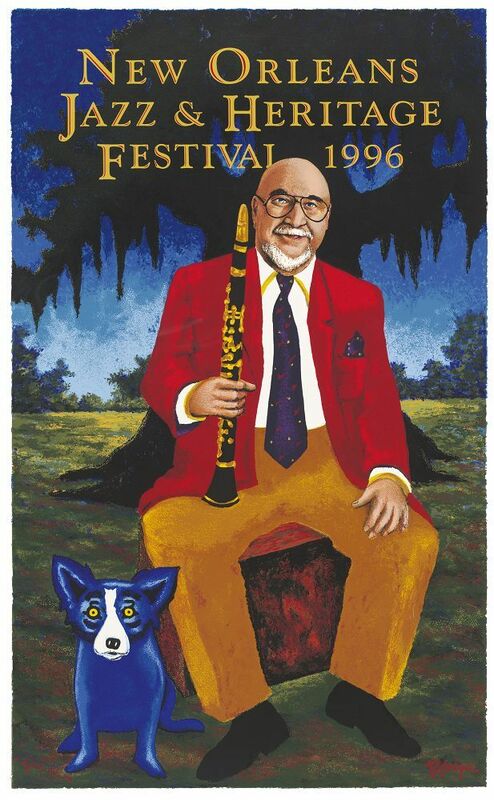 ProCreations, producing the New Orleans Jazz and Heritage Festival poster since its inception, hoped to honor Hirt with a Rodrigue portrait for the 2000 poster. Despite his earlier protests, George hesitated. 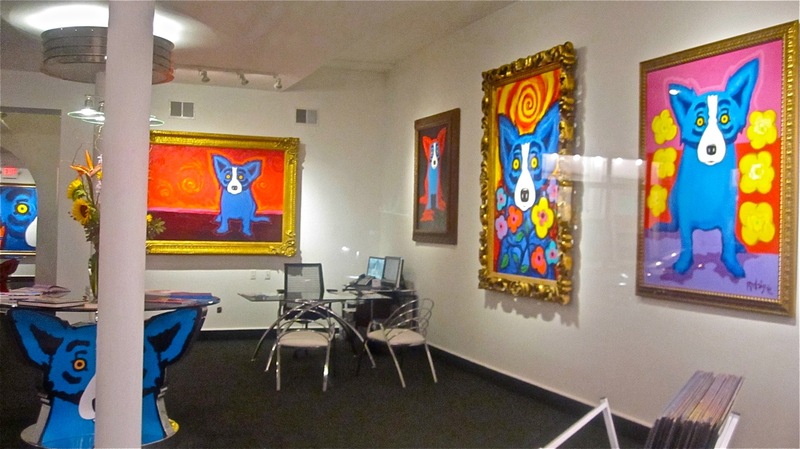 Hirt was an old friend and a collector of his Blue Dog paintings. 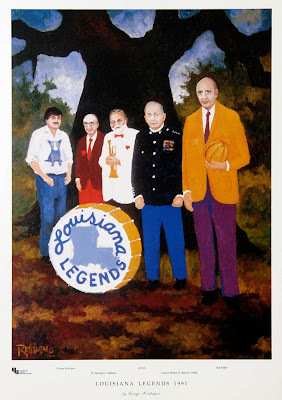 The two first met when George painted his portrait as a Louisiana Legend and they were honored together by Louisiana Public Broadcasting in 1991. The opportunity to paint Hirt again was tempting as a personal tribute as well as a millennium commemoration. Nevertheless, George declined, still stinging from the 1996 Jazz Fest poster experience. 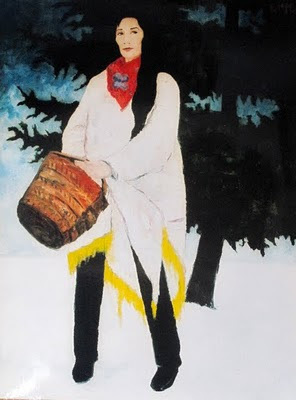 That summer of 1999 he received a call from Hirt’s widow, Beverly, who explained that it was her husband’s wish that George paint him for the poster. 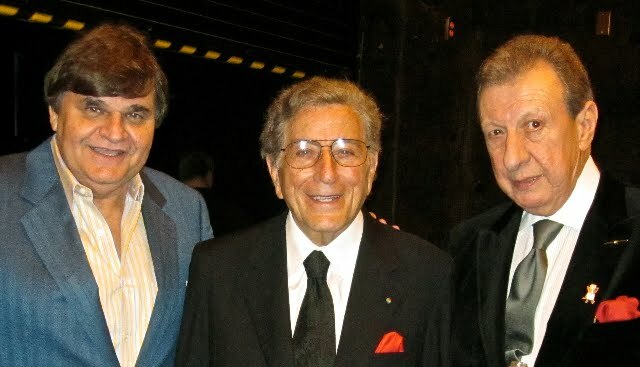 This was a request he could not refuse, and he agreed to the portrait, his third and final in a trilogy of jazz greats. The public backlash was immediate from local artists and press. This time, however, George was prepared mentally, knowing that it would not be easy. He created the poster as a tribute to an old friend, and this lofty resolve softened the blows. Among other things, George was accused of a lack of originality in his concept. However, as you may remember, his original design for 1996 with Mahalia Jackson included a different background. 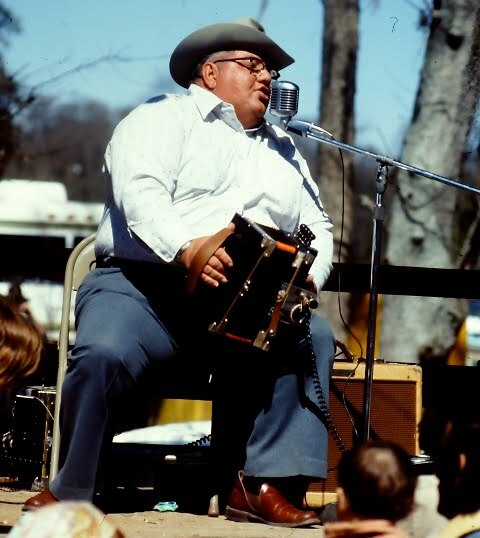 It was the last minute subject change and short deadline that left him without time to rework his composition for the Pete Fountain design. 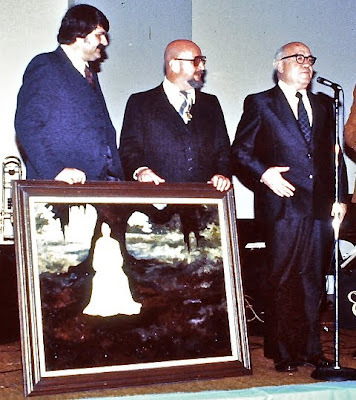 Now with Al Hirt, although George had plenty of time, it made sense to paint him in the same way as the others, creating a trilogy of three great Jazz musicians playing music under the oaks. Unsure at first about the inclusion of the Blue Dog in his designs, George came to realize its importance in the trilogy. Through these three Jazz Fest posters the Blue Dog became (for many) a symbol of New Orleans. It’s been ten years since George’s last Jazz Fest poster, and although ProCreations calls he continues to decline. He truly does feel that the poster should showcase upcoming Louisiana artists, and he enjoyed the phenomenon personally already to its fullest. Ironically, people visit his gallery all of the time assuming he’s a regular Jazz Fest poster artist, creating the poster often or even every year. George also hopes to see artist Hunt Slonem create the poster. Slonem (pictured above) is a New York transplant who first came to New Orleans as a Tulane student years ago, but more recently makes Louisiana his second home with the restoration of historic plantations such as Albania and Lakeside. George admires artist Douglas Bourgeois and his 2008 poster of Irma Thomas, as well as Bill Hemmerling, who painted Charles 'Buddy' Bolden in 2005. 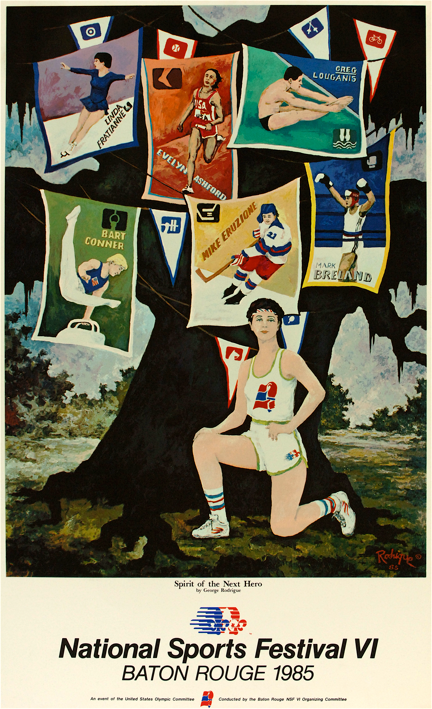 As with Rodrigue and Michalopolous, Bourgeois and Hemmerling are Louisiana artists focused on regional motifs, and their well-defined, yet unique styles add variety to the poster series. 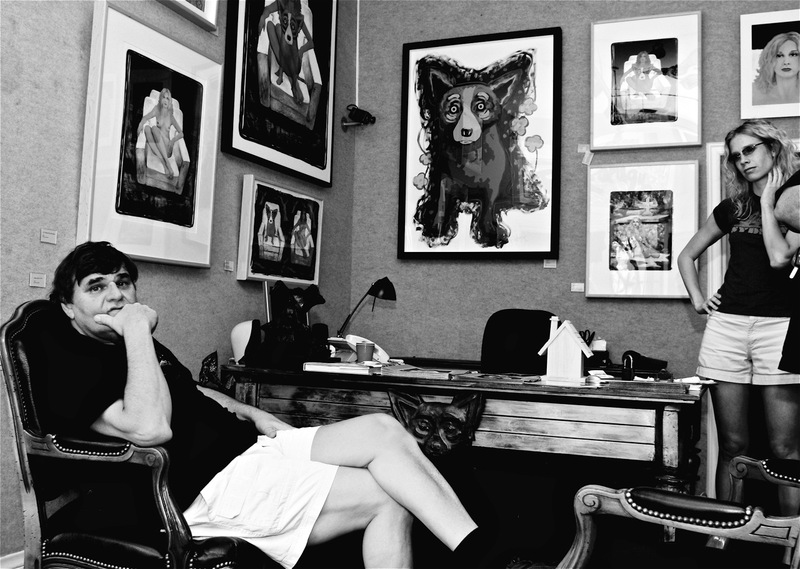 His concept, which falls on deaf ears, involves a contest open to all Louisiana artists, with the winner chosen by the state’s residents. For a while the poster ruined the festival for us. 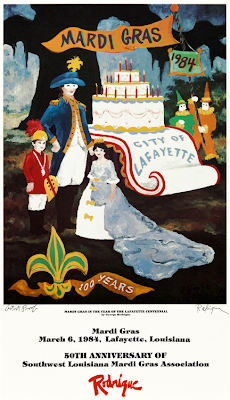 Like every Jazz Fest poster artist, George spent long hours signing and remarking thousands of prints, and by the time he finished, the Fest seemed like work, an exercise in public relations as opposed to a musical escape. For Part 1 of this story, link here. Ever since losing our mother, Mignon, my sister and I take a week in the spring just for us. We should have done it years ago, with her, but now instead we travel together with her diaries and her memory, painting our fingernails purple and normalizing our eccentricities, making them near trendy, because crazy seems less crazy in a pair. This year we tried Santa Fe, and after an over-indulgence downtown of shopping and weird dance classes and margaritas, we headed to the mountains for a few days of quiet. 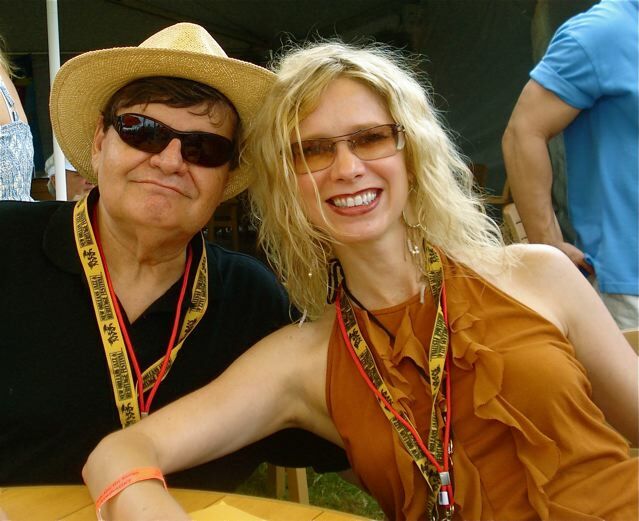 Heather and I grew up with Mignon at sea level on the Gulf Coast of Florida, the Panhandle, the most beautiful beaches in the world, and today we live at that same level, Heather in Tallahassee and me in New Orleans. Here in New Mexico at 7,000 feet, we treat our hands to paraffin wax and complain about our swollen limbs (damn that water retention, because surely it’s not the margaritas! ); we pant on our walk up the hill and convince each other that we’ve elevated our heart rates enough for one day; we build tiny snowmen outside our hotel room door in the unexpected late-spring flurries, and we spend our afternoons by the fire, reading the incredulous account of our parents’ high school courtship. Could they really and truly have been that much in love? In the quiet, while Heather’s off at the spa for an ayurvedic oil drip, I think about our mom, and I think about this blog and what I want to share with you, my reader, what’s not too personal, yet at the same time, honest. Heather and I visited the Georgia O’Keeffe Museum this week. It was her first encounter with the original canvases, and despite my warning that they’re “thin and weak” compared to the book reproductions, she was taken with these paintings by a woman artist struggling in the 1930s and 1940s for a voice outside of New York and outside of a famous love affair. Santa Fe is the closest thing to New Orleans that I know. Agreed, they look nothing alike. They feel nothing alike. But both towns breed tourists. What I mean is, we all happily and effortlessly play the part. (For more, see the story Rosalea Murphy, the Pink Adobe, and Paintings of Evergreen Lake). In Santa Fe, the locals are more decked out than the tourists, in turquoise and fringe. 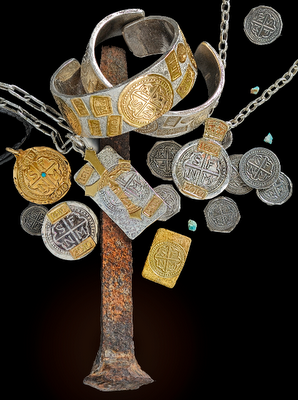 They plan their summers around the Spanish and Indian Markets, and they burn pinon wood in July in the fireplaces of their adobe houses. In New Orleans, we go to Mardi Gras parades and Saints games and Jazz Fest. We eat po’boys, boil crawfish, and walk to Café du Monde for coffee-milk and beignets. We live the stereotype. Heck, one recent Valentine’s Day George surprised me with a horse and buggy at our front door for a stop-all-traffic carriage ride to K-Paul’s Louisiana Kitchen in the French Quarter, where our blackened redfish and shrimp creole awaited. 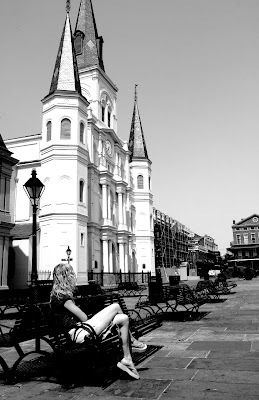 We live in the Big Easy, but we’re also its tourists (except we do draw the line at flashing skin on Bourbon Street or the pronunciation “Nawlin’s,” both reserved as distinguishing characteristics of real tourists). In addition, both towns are magnets for the creative types. 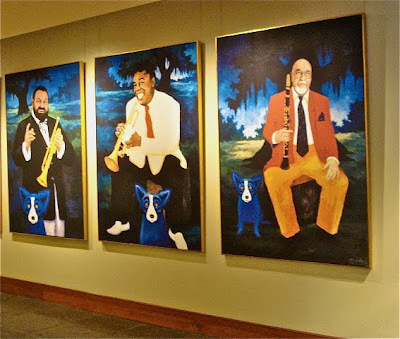 George Rodrigue, for example, flourishes in New Orleans, the city where the Blue Dog was born, a city, or rather a state, that’s heart and soul remains with him even as he paints each summer in Carmel, California. This doesn’t mean, however, that George isn’t inspired by other places. 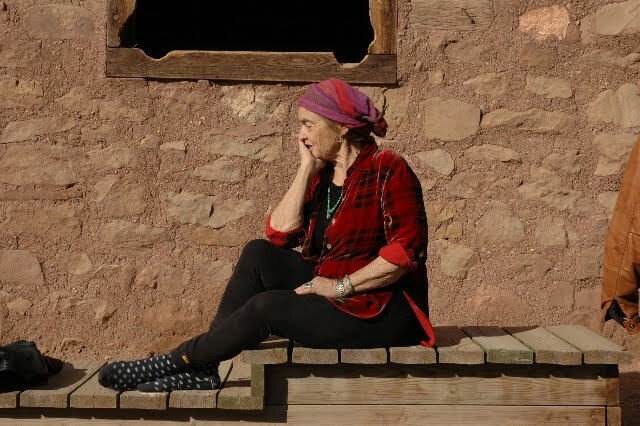 We visit Santa Fe at least once a year, and he always leaves with ideas and enthusiasm, affected not only by the land and history of the place, but also by his artist-friends. These are real companions of his generation who understand his fly-by-the-seat-of-his-pants world, because they live the same way, jumping into life with the determination to live as artists, a profession denounced by 1950s parents everywhere, with the possible exception of our artist friend Rosalea Murphy, who encouraged her daughter Priscilla Hoback (pictured, as photographed by Dana Waldon, Santa Fe). 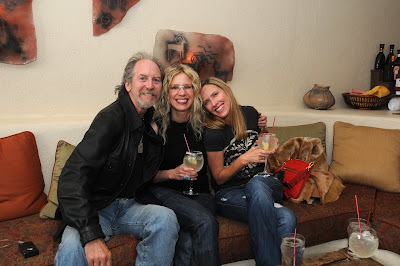 For Heather and I, two sisters desperate not to miss a second of quality time together, Santa Fe assuages us. Like most of you reading this blog, we learned that terrible lesson of loss and regret, and we’re determined to heed its warning. 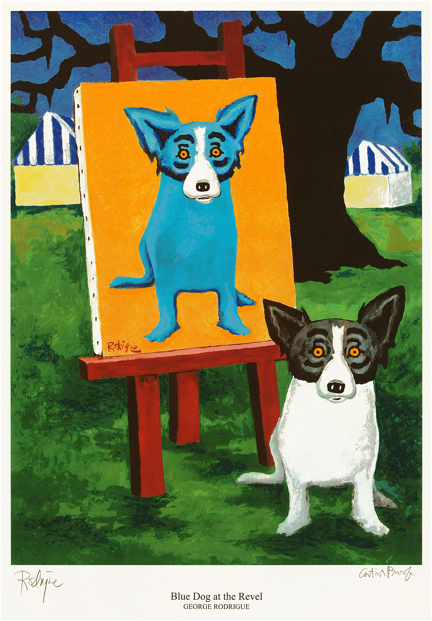 In 1994 when first approached by ProCreations, the poster company for the New Orleans Jazz and Heritage Festival, George Rodrigue hesitated. 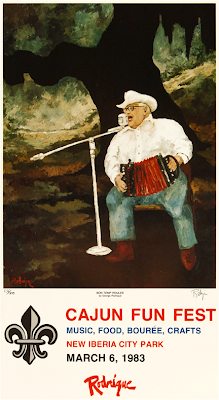 Up until this time Jazz Fest posters included only musicians that actually played at the Fest. 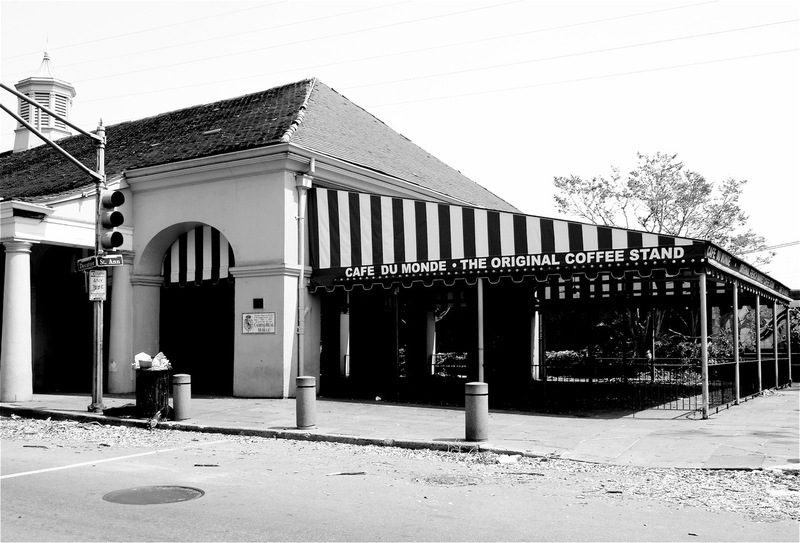 Louis Armstrong died in 1971, the year after the first festival, and he did not get the chance to play at the park that would eventually bear his name: Louis Armstrong Park, formerly Beauregard Square, home to Jazz Fest its first two years until it moved to the Fairgrounds. The festival’s poster committee debated using Armstrong as a subject. 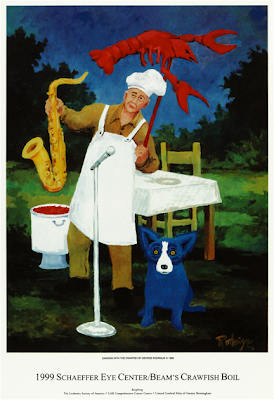 The Blue Dog, George felt, made no sense in a Jazz Fest poster. 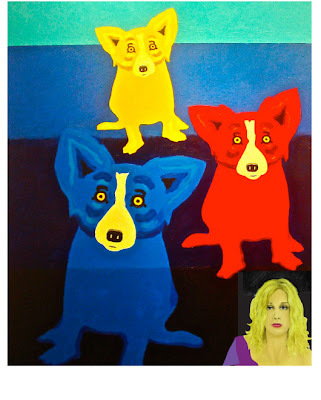 The Blue Dog is a strong image, front and center, painted like a person. He never intended to throw it in at the bottom of a composition, as a signature of sorts, making little sense in relation to the real subject. The poster committee compromised. George could paint Louis Armstrong provided he include the Blue Dog. The next hiccup came after George finished the painting. 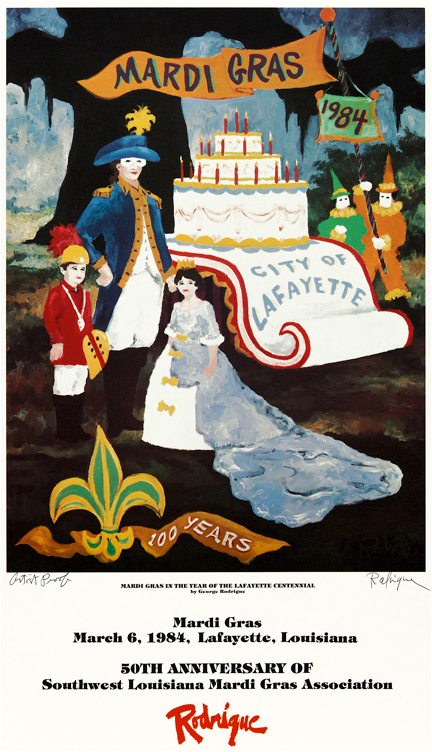 He lost control of the poster, and the resulting changes, due to bump colors and other choices by the printer and committee, resulted in a silkscreen that differed greatly (to his eye) from his original painting, changes he accepted far better in 1995 than he did with his Pete Fountain poster of 1996. The 13,000 Louis Armstrong silkscreens turned out to be the most successful in Jazz Fest history, with the entire edition selling out before the second weekend. I’d say that signifies a successful compromise! Don’t get me wrong: this is not a money-maker for the artist. 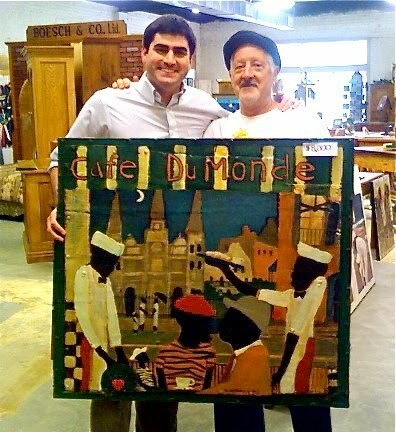 George makes less money on creating a Jazz Fest poster than he does from the sale of one painting. But the promotional value is priceless and, frankly, so is the honor. After years of painting festival posters for small towns throughout the state of Louisiana, Jazz Fest gave George a vehicle to make it big for the first time ever in New Orleans. 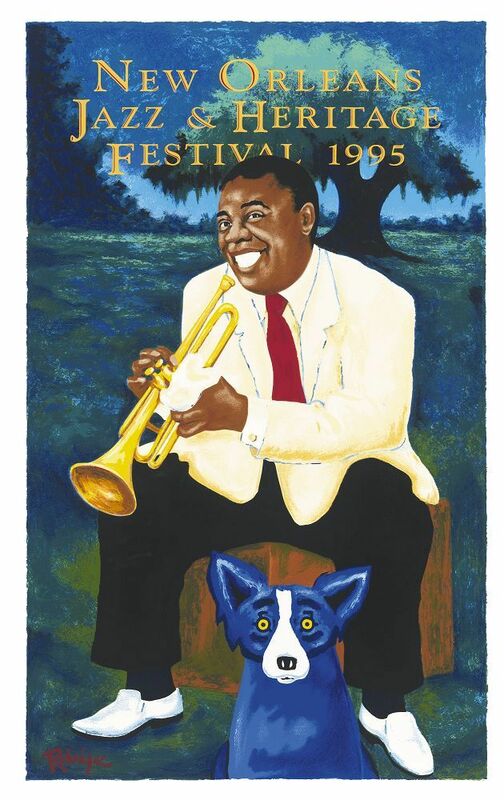 So does the Blue Dog belong in a Jazz Fest poster? Whenever George talks about painting another poster, that very subject comes up. 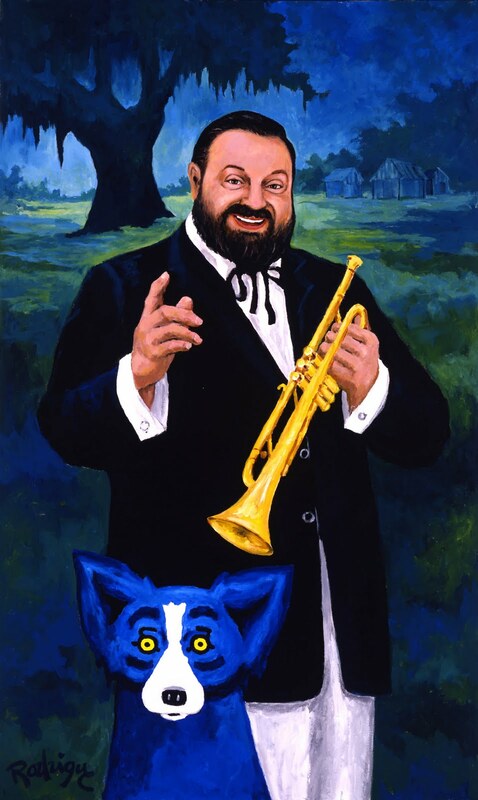 Jazz Fest approached him several times over the years, but his attitude remains recalcitrant, and his answer a firm ‘no.’ For a while we tried to convince the public (as much as ourselves) that the Blue Dog is the Blues! It grew out of the New Orleans cultural scene, no different than the music. But truth be told, its appearance in this poster doesn’t make much sense, especially if George is to retain the integrity he established behind this image. I mean, why throw the dog at the feet of someone in a poster, when its power comes from its eye-level stance? 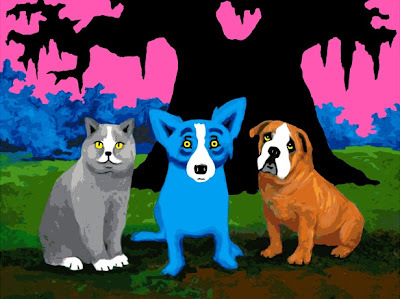 Better yet, think of it the other way around: the Blue Dog as the subject and Louis, or Pete, or Clinton, or Jindal as the small tiny shape at its feet. For those of you out there wondering if George feels trapped with the Blue Dog, I hope that after reading these blog posts you now have a better understanding of his disposition. It’s not the dog, but rather the “I want to be painted with the dog” that traps him. He does it, rather than not paint Louis Armstrong or the Governor or the President. 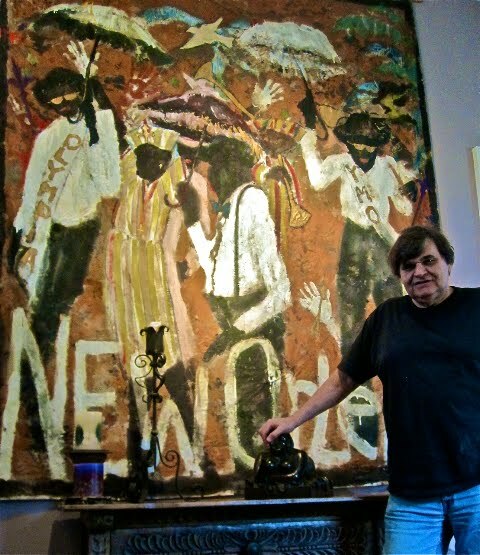 But to understand the real Rodrigue, the artist with total control, stop by the gallery. There, he paints only what he wants. There, the dog is King. 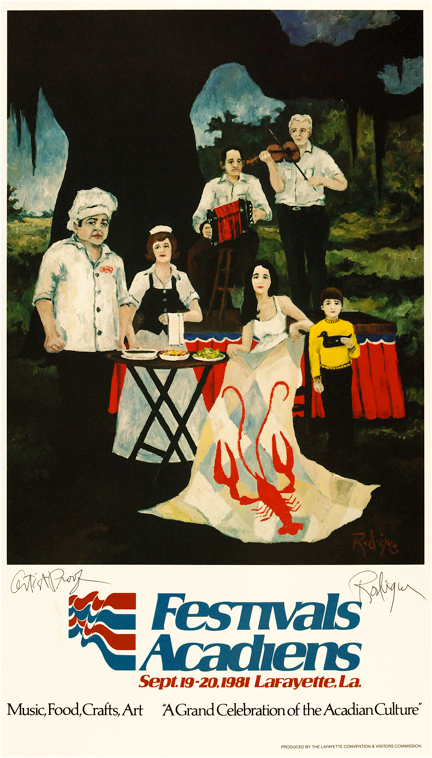 Following the success of the 1995 Jazz Fest poster, the ProCreations committee asked George to create a new poster for 1996. He hesitated again, worried that he might offend New Orleans artists, those folks vying for the exposure from producing the now-famous poster. But he gave in amid pressure and agreed to paint the great gospel singer, Mahalia Jackson. 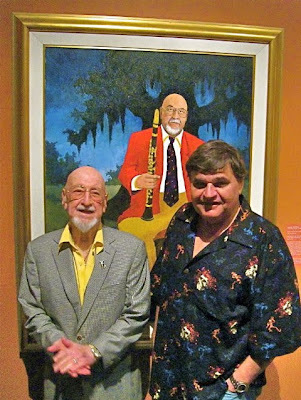 "Either I paint my friend Pete Fountain, or you’re without a Jazz Fest poster." To their credit, ProCreations agreed immediately. On Christmas Eve 2005, George painted all night, throughout Christmas Day and the day after, so that the poster could go to print on the 27th, in time to make the festival deadline. ProCreations altered the poster dramatically, eventually scanning an actual photograph of Fountain’s face over George’s painted version. 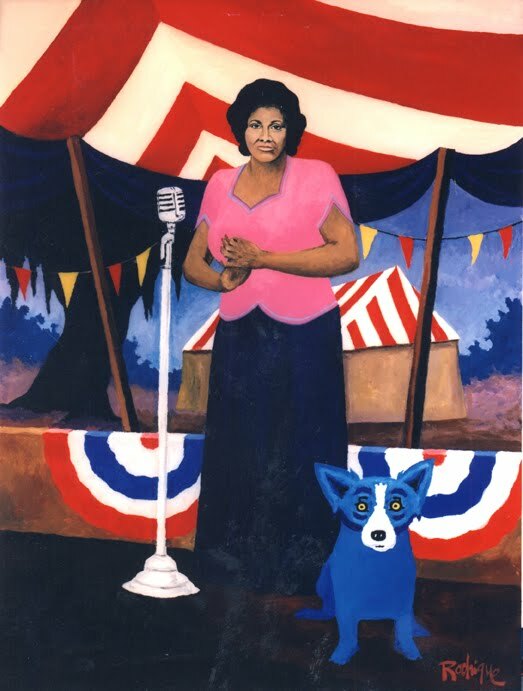 As if this change, after the Mahalia Jackson fiasco and the short deadline was not enough, local artists picketed the door of the Rodrigue Gallery, furious that George again created a Jazz Fest poster, in their opinion (according to their picket signs) depriving one of them of the opportunity. This was a tough blow for George. He was shocked, even devastated, by this response from local artists. 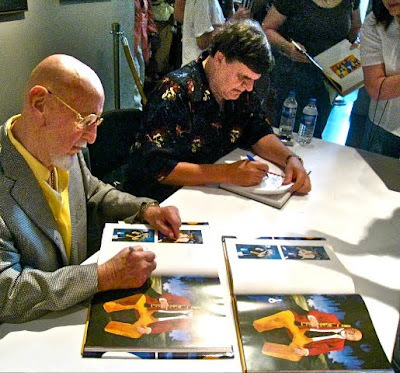 Yet he enjoyed the experience of painting Pete Fountain, a man he’d known and respected for many years. 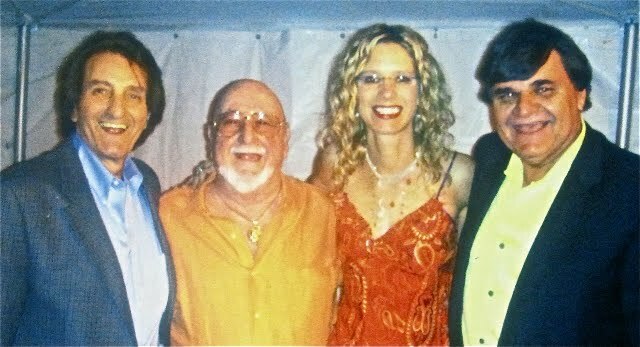 It was in 2000 that he again agreed to a Jazz Fest poster, his third and final, after swearing that he would never do another. The unforeseen scenario is better saved for the next blog, as are George’s ideas on how Jazz Fest should select its artists, as well as his choices for the best posters. I’m sitting on our back porch drinking a fabulous glass of rose wine shipped to us today from Georis Winery, a tiny establishment down the street from our house in Carmel, otherwise known as la-la land. The bottle arrived this afternoon in a box with our club membership, and I couldn’t resist. From my vantage point I see the west bank of the Mississippi River, and I watch last year’s amaryllis bulbs, the ones I threw in the yard from our 2008 Christmas planters, breathe and grow thanks to the winter’s freeze, during which we lost (so I thought) everything but the oak tree --- which is the most important plant after all, since Mr. Foche probably nurtured it himself when he built this house in 1835. These pink flowers, the color of Georis rose wine, are the only things threatening to bloom alongside the pond, where three fish, Katrina survivors, swim. (We started with forty, and in all fairness, the egrets got most of them long before the storm). I don’t think Treme (based on a neighborhood only a few blocks from ours…or one that might as well be ours, since the movie trucks park out front near daily) was fabulous, but I don’t think it was awful either. 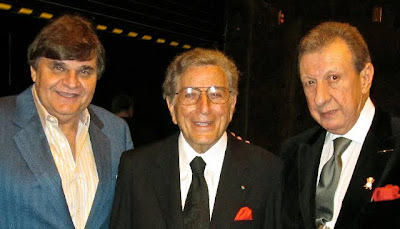 It’s a premiere, and I’ve yet to like a premiere, not even Murder, She Wrote or The Golden Girls, which I love today in their reruns, but which nearly lost me years ago out of the gate. At first it seems like a sick joke on behalf of the Treme writers to suggest restaurants and groceries and water bills and newly painted houses and dumpsters and taxis (and Elvis Costello and a limousine!) and Zapp’s potato chips and safe neighborhoods and nighttime streets devoid of hoodlums, and people who feel like singing ---- all just three months after the storm. 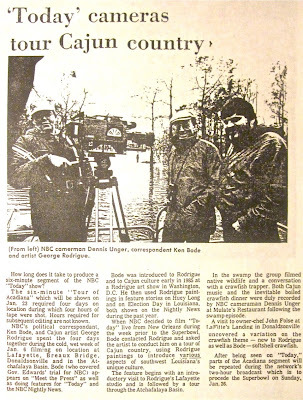 And yet right this second, four years and thirty weeks after George and I (the oh-so-fortunate) sat in a hotel room in Houston and watched on television as our city drowned, I sit on our 175-year-old porch and watch the tops of the ships go by. I see tourists wave to the shore of the river that made Louisiana the key state in Napoleon’s sale of 828,000 square miles of this country, and I watch our oak tree, now held together by steel wires and sprouting strong for the first time since the storm, near floating, swaying, and shaking its branches to the beat of New Orleans. Three months after or four years and thirty weeks after --- I guess it doesn’t much matter. I’m supposed to be writing about Jazz Fest. Good grief, there’s a two-part series I promised you! And yet I’m drugged and distracted by (okay, the wine) the sounds of New Orleans, of the electric guitar floating this direction from the Bywater, mixing its resonance with the tugboat engines, the train whistles, and the scrape of car rims against our pothole (less than a month, Ray, less than a month…). We couldn’t ask for help. It’s a tree! 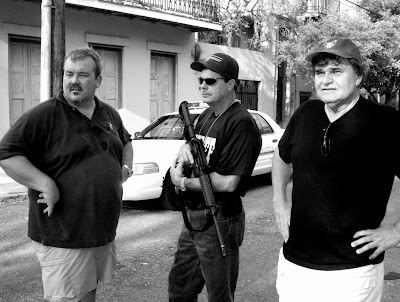 Through the kindness of a police officer we were allowed into New Orleans three days before Rita struck. We saw an abandoned city, a twilight zone, not a car, not a person, not a bird, not a sound, nothing. We walked through an empty and immaculate Jackson Square, perhaps the only place in New Orleans devoid of debris, the backdrop for our president's televised speech. We found our house wide open and remarkably, shockingly without vandalism. In the 100-degree heat we climbed up and down the three flights with paintings. You see, we did not evacuate, but rather, by happenstance, were in Houston for an exhibition. Evacuation differs from weekend travel. Weekend travel is cocktail dresses, bathing suits and make-up. Evacuation, however, is paintings and photo albums and whatever that last little thing is that one dreams of having on a deserted island. We have pictures of all of this, but I hate looking at them, and I don’t want to share them. 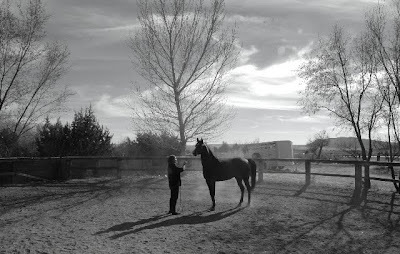 George talked me into a few, however, and I sprinkled his choices throughout this blog. No doubt, Treme missed a lot. But I think that’s okay. The show actually idealizes us in some important ways, too painful, too heady, and too political to detail here. However, I’d be hard-pressed to find anyone who wouldn’t fall on their knees to see a Mardi Gras Indian dressed and singing with conviction even now in their street. 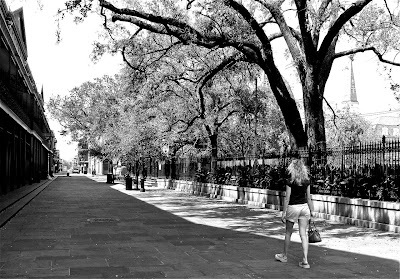 And yet our oak, twice each year since Katrina, holds parrots, a whole hierarchy of them, from the top of the tree to the bottom, the macaws to the finches, a migrating flock of freed animals, perhaps the meaningful equivalent of a costumed tradition. I realize that Treme is a TV show; it’s reality-based fiction, not a documentary. It’s okay with me that the story is skewed. And it must have roused feelings for everyone here in New Orleans who watched it. Somehow Treme makes us look wonderful and like a third world country, both at the same time. Heck, just three months after Katrina we’re downright beguiling! But then, maybe we always were. 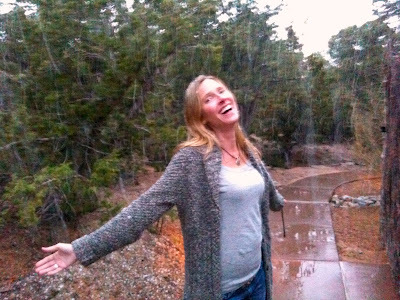 I remember the first time I laughed after the storm: My friend Geri described the $200,000 worth of rodent damage to her house as "squirrels gone wild." Visit New Orleans if you get the chance. Go to Vaughan’s and hear Kermit Ruffins. Eat a po’ boy. Take a carriage ride. Visit the New Orleans Museum of Art. 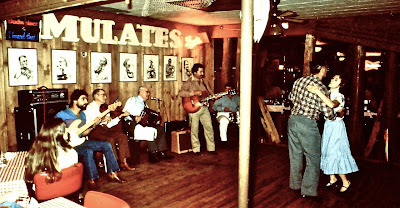 Dance at Mulate’s. Ride an airboat through the swamp. Drink a hurricane. Take a cemetery tour. And if nothing else, walk on a levee. 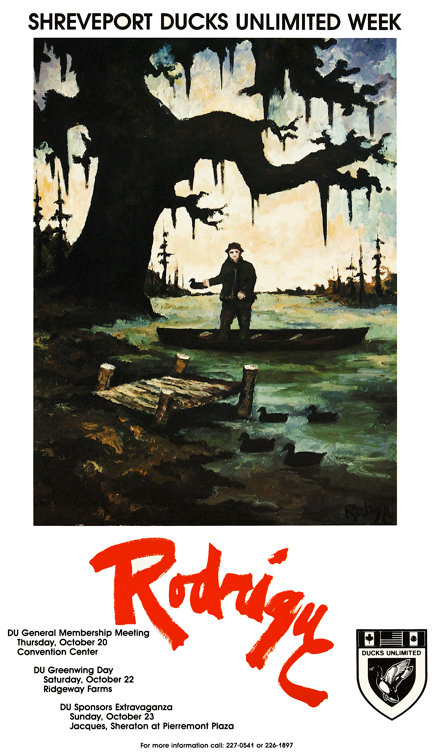 If you ask George Rodrigue what made his art famous in Louisiana, his answer might surprise you. It’s not the Blue Dog, Absolut Vodka ads, or Jazz Fest. Rather, it’s the small town festival posters. He often posed his friends, dressing them in elaborate costumes for these compositions. 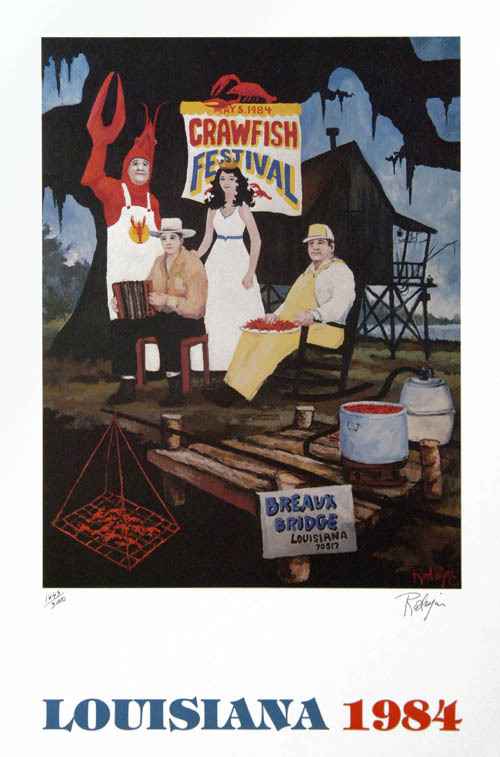 In the 1984 Breaux Bridge Crawfish Festival poster, for example, his Catholic High buddy Ed Vice, who you might remember as the giant Mardi Gras rabbit, stands in a crawfish suit; Lennis Romero of the St. Martinville Romero Brothers, featured in the Musicians blog, plays the accordion; Diane Bernard Keogh, who normally appears in Rodrigue paintings as Evangeline, poses as the festival Queen; and George’s old friend Ray Hay of Houston’s Ray Hay’s Cajun Po-Boys, peels the crawfish. 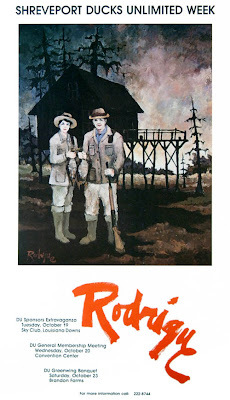 This painting, featuring these staged characters, is quintessentially Rodrigue, with the strong shapes of the oak tree and cabin framing these subjects, as well as the interesting pattern between branch, sky, and roof on the right side. 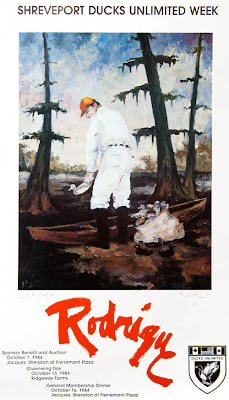 But if you ask George, he’ll tell you that the best part of this painting is the zip code for Breaux Bridge, which he added as an after thought. (In 1989 Ken Bode covered the unveiling of George’s portrait of Ronald Reagan for a national story for NBC Nightly News; and during Mardi Gras of 1992 he visited Lafayette, Louisiana for George’s reign as King of the Krewe of Xanadu, featuring Mardi Gras outside of New Orleans, also for NBC Nightly News. Coincidentally, George appeared that same week on the front page of the Wall Street Journal for a story about his Blue Dog paintings). 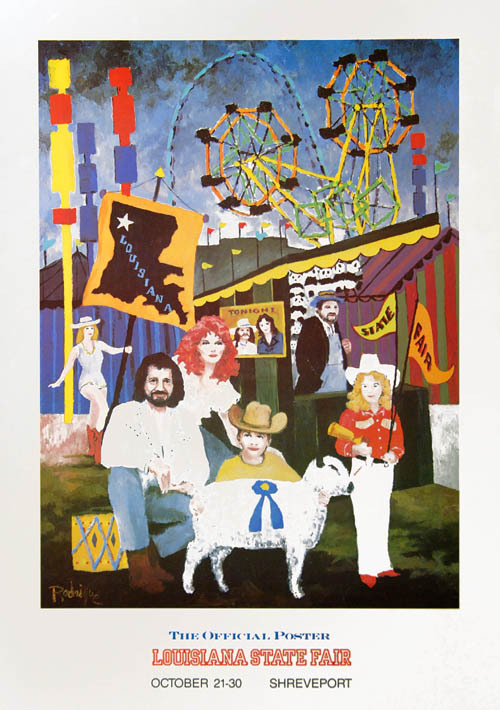 And the Louisiana State Fair, as in the Shreveport poster below, featuring singers Shelly West (daughter of Dottie West), David Frizzell, and Boxcar Willie as models. George also created three posters for Shreveport’s Ducks Unlimited at the request of its president, his good friend and collector, Carl Wiley Jones. 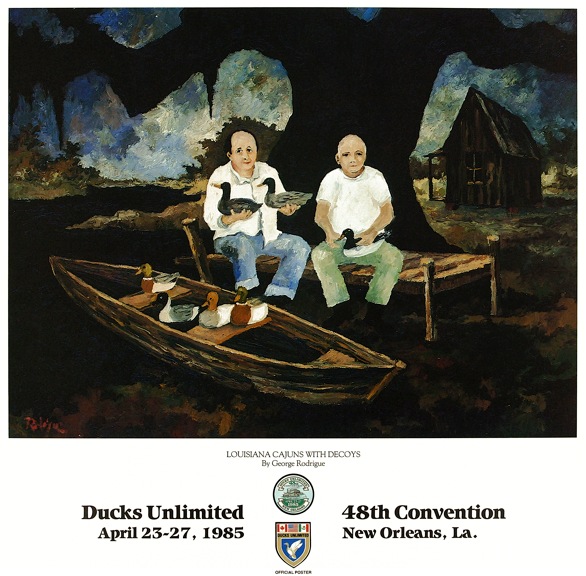 Following the success of the Shreveport posters, National Ducks Unlimited commissioned this poster for its 48th Convention in New Orleans in 1985. 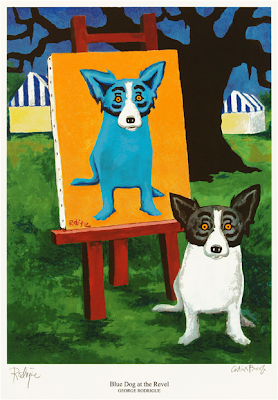 George designed several festival posters using the Blue Dog during the mid-late 1990s. These include three silkscreens (1997, 1998, 1999) for Shreveport’s Red River Revel, benefiting art education in north Louisiana. 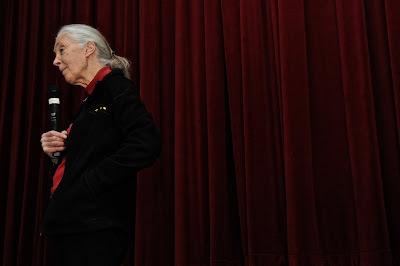 It was at this festival, on a stage beneath a large tent, that George and I honed our lecture and painting presentations. In 1998, 1999 and 2000 George’s silkscreen posters promoted the Schaeffer Eye Center/Beam’s Crawfish Boil in Birmingham, Alabama, benefiting the Leukemia and Lymphoma Society. Without question, George’s most requested festival posters are his designs for the 1995, 1996 and 2000 New Orleans Jazz and Heritage Festival. To give this history its due, however, they require their own post, indeed a series of posts, all coming in the following weeks. 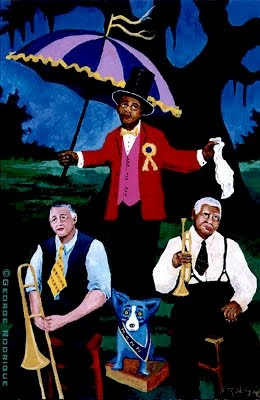 In the meantime, I share with you his poster from 1998 commemorating the 50th anniversary of the New Orleans Jazz Club, the oldest jazz club in the world. The club’s long-time president, Mrs. Frances Fernandez, approached George in early 1998. 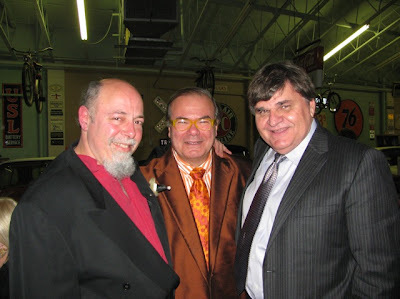 Recognizing their mutual respect and unable to resist each other’s charm, they became fast friends, and sales from the silkscreen poster saved the historical music society from bankruptcy. 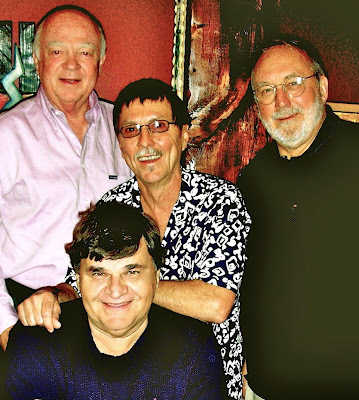 (For more on Frances and the New Orleans Jazz Club, see the article by Times-Picayune music reporter Keith Spera here). 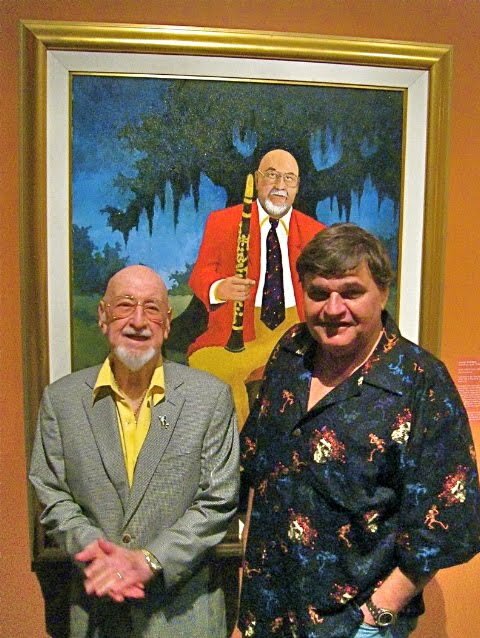 In a relationship sparked by this friendship, Frances’s son Wayne Fernandez and grandson Gus Anderson, along with Educational Director Marney Robinson and George’s son Jacques Rodrigue manage the George Rodrigue Foundation of the Arts. Today, George avoids these types of posters. His last one was ten years ago, a silkscreen of Al Hirt for the New Orleans Jazz and Heritage Festival. 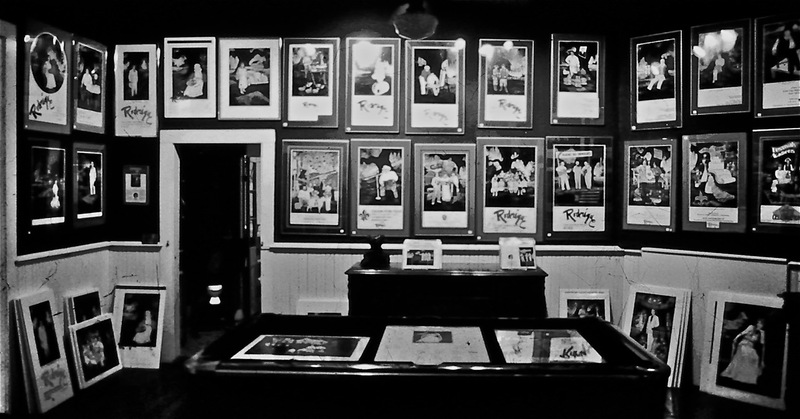 Mass-produced prints are hard to control, and they often end up in poster shops, in large quantities and with inflated prices, competing not only with George’s galleries, but also with the worthwhile organizations for which they were intended. For George, it makes more sense to create high quality silkscreen prints, sold exclusively to non-profits through the George Rodrigue Foundation of the Arts, benefiting its educational and scholarship programs. For a comprehensive collection of Rodrigue's fair and festival posters, including those mentioned in this post and more, see the book George Rodrigue Prints (Harry N. Abrams, New York, 2008), available at your favorite independent bookstore or on-line bookseller.